Smartphone Fanatics: Surprise! Apple Releases iOS 5.1.1! Surprise! 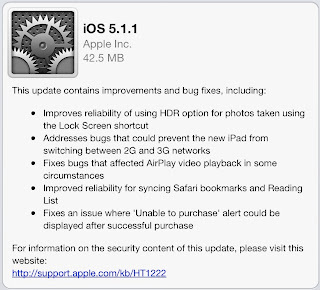 Apple Releases iOS 5.1.1! I was completely unprepared for what I will call today's surprise arrival of iOS 5.1.1. You can install the update in one of two ways: directly from your iOS 5.x device or by syncing your iDevice with a Mac or PC running the latest version of iTunes. 5. Follow the on screen directions. I'm just happy for updates at all! Before the iPhone made smartphones main stream, i've owned about a dozen phones with the ability to update, but the manufactures never pushed a single update.